And just like that, summer is right around the corner. I'm ready! More ready in ever, in fact. Which is why I've partnered up with Johnston & Murphy to share with you my new favorite pair of summer kicks that make me dream of my next tropical vacay as soon I slip them on. I mean, let the tropical floral print speak for itself. Introducing the Elaine Slip-On by J&M. As a lover of old school VANS (since circa 2002) these shoes embrace the look and feel of the classic slip-ons we all know and love but they kick it up a notch, quite literally. 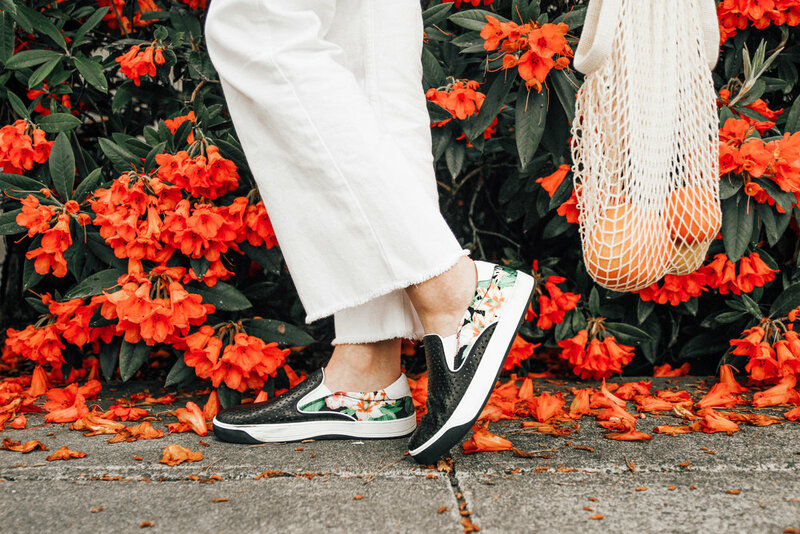 The perforated leather combined with the floral accent on the back heel make for the ideal shoe for a girl that embraces color, pattern and texture but still longs for a trusted and classic shoe. They are a little on the pricier side at $148 for the pair but you're investing in high-quality leather and the comfort of these slip-ons. I'm a girl who loves shoes but more often than not shoes are the last thing I think about when I'm pulling together an outfit. It's funny, I know, but I tend to find a pair of shoes that complement an outfit I'm wearing rather than base my outfit around a pair of shoes. However, this pair of shoes has the opposite effect. When I wear these slip-ons I find that my outfit revolves around these shoes and I have to say, I don't mind it. Johnston & Murphy has inspired me with their mantra #startwithshoes to be better at making shoes a priority and letting them shine in an outfit rather than making them an after-thought. This head to toe outfit (Boss Babe tee + white denim courtesy of my new favorite Denver boutique, Meraki Moon | Market Bag from Amazon | Initial Necklace from Gigimey) came together with the help of my new slip-ons that I wear proudly in the months leading up to summer. When it comes to strategizing your look of the day, I encourage you to #startwithshoes and share what outfits you come up with as a result! *Collaboration note: Thank you Johnston & Murphy for collaborating on this product sponsored blog post! All thoughts and opinions expressed on West Coast Aesthetic are my own and every collaboration is done with absolute integrity.